Персонаж - Jedi. Очки: 10/13. Здоровье: 10. 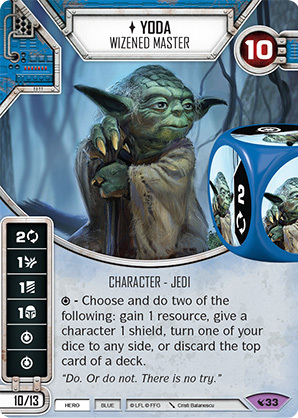 - Choose and do two of the following: gain 1 resource, give a character 1 shield, turn one of your dice to any side, or discard the top card of a deck. "Do. Or do not. There is not try."